mài kè: nĭ jiā yŏu shén me rén? Mike: Who are there in your family? lìli: wŏ, fù qīn, mŭ qīn, gē ge hé mèi mei. Lili: My father, mother, an elder brother, a younger sister and me. mài kè: nĭ fù qīn duō dà suì shù? Mike: How old is your father? lìli: tā jīn nián liù shí le. Lili: He’s sixty years old. mài kè: tā hái gōng zuò ma? Mike: Is he still working? lìli: tā yĭ jīng tuì xiū le. Lili: No, he’s already retired. mài kè: nĭ mŭ qīn gōng zuò ma? lìli: tā shì gè jiā tíng zhŭ fù. Lili: She is a housewife. mài kè: nĭ gē ge hé mèi mei ne? Mike: How are your brother and sister? lìli: wŏ gē ge shì dài fu. wŏ mèi mei hái zài shàng zhōng xué. Lili: My brother is doctor. My sister is studying in a middle school. 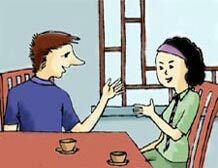 In China, people often ask about their friends’ parents or children during conversations to show respect and concern, and people asked are normally pleased about this. Therefore, talking about family is one of the most important aspects in a conversation.